With increased urbanisation, a need to promote peri-urban farming has evolved. Lydia Odiyo Okwengu is one of the farmers working with MEAP in promoting peri-urban farming with a view of improving the livelihood of the peri-urban farmers by ensuring household food, nutrition security and generation of income to enable her meet her other needs. Lydia has established a number of enterprises on her 50 by 100 feet plot. The enterprises include poultry, sheep and goat rearing, a dairy cow and a kitchen garden. The poultry enterprise is stocked with over 200 indigenous chicken- she sells the birds and maintains sizeable stock. She uses hens to hatch the eggs, supply the family with eggs for consumption and sells the extra in Molo town. 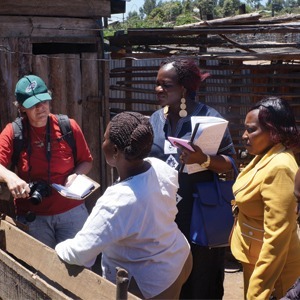 Income generated from sale of eggs and chicken goes to address family financial needs, and fuel fees for the livestock officer who monitors and treats her livestock. She has developed a stock management system where she is able to identify the best brooding chicken, set brooding boxes, systematically identify chicken with good characteristics and dispose those with poor characteristics, and eventually improve her stock with desirable characteristics that include laying ability, brooding, body weight and meat provision. She targets to increase the chicken stock to 1000 next year and 2000 by 2018 so as to have a continuous supply of chicken meat and eggs to her outlets. Lydia rears milk goats and sheep. Milk goats were introduced recently to supply her family with milk and possibly sell extra milk to the neighbours. She keeps the sheep as an income generating enterprise since sheep do well, multiply easily and demand for mutton has increased in the recent times. Recently, she sold eight sheep at KES 8,000 each thus earning KES 64,000 that was spent as school fees. Likewise, Lydia keeps dairy cows. The cows also supply milk to her family while the surplus is sold. During peak periods one cow produces 18 litres of milk a day and in low periods about 10 litres a day. Each litre costs KES 40. The money generated from milk sales goes towards acquiring feeds, treatment and management of the livestock as well as supporting the household financial needs. She stocks feed for the animals that last for at least one year from hired land and also buys from other farmers. Lydia has also established and manages a kitchen garden with indigenous vegetables for her family’s consumption.